Australia is home to the largest barrier reef in the world offering touristy coral dives to exclusive wall diving and shark encounters. The Tassie Two or Tassie II is a small ammunition supply boat that sank at the end of WWII. A dive near Hippolyte Rock is a must if you want scuba diving with Australian Fur Seals. Three coral bommies and its many colorful inhabitants have named this spot the Colours. Dolphin Point is a great hard and soft coral dive in the north of Hayman Island, Whitsundays. Australia is by far the most popular diving destination in the world. With the 2,000 kilometer long Great Barrier Reef, a very large fringing reef near Exmouth (Ningaloo Reef), a UNESCO world heritage area (Shark Bay) and plenty of shipwrecks around the coast, it is allowed to hold the number one spot. The waters surrounding Australia offer some of the widest variety of coral life and marine species. From migrating Minke and Humpback Whales on the Great Barrier Reef to dugongs and enormous fields of sea grass in the Shark Bay area. You can find wicked tunnels at Fish Rock Cave, South West Rock, or dive the heroic war wreck such as the HMAS Perth in Albany. 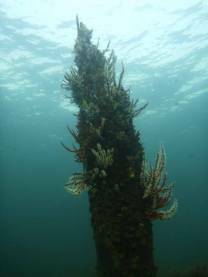 There are excellent shore dives just off Manley, Sydney, or you can amaze yourself with the fantastic marine life living at the wreck of the Yongala in Townsville. Even more north, you can find the Cod Hole, Ribbon Reefs, just offshore Port Douglas, where you can find not only tons of huge potatoes cods but also a variety of things to do. Diving in Australia is blessed with tropical marine species as well as those living in cooler waters, providing for a huge underwater diversity both in coral and in aquatic life. Coral reef fish, whales, pelagic action, shark feeds, turtles, just some of the things you can find on your diving holiday in Australia. Diving is well established in most beach towns and it is not a problem to find tour operators that book you on the first diving boat that goes. Cairns and Port Douglas are known for its wicked live-aboard holidays but also in Western Australia, you can book multiple day trips to the Rowley Shoals. Getting certified is cheap and with this many diving, dive shops can be found all around the coast. The more professional divers might go to exclusive locations in the Torres Strait and the Northern Reefs which are less visited and have even healthier coral formations and fish life. Several other popular dive destinations in Western Australia are Dunsborough (HMAS Swan), Perth and Rottnest Island. To the east you can dive at Seal Rocks, Julian Rocks (Byron Bay) and the Whitsundays. Australia's climate ranges from tropical all year around in the north to excellent dry suit diving near Melbourne, Adelaide and Tasmania in the south. Australia is blessed with a stunning shoreline, lots of sun, pretty coves and white beaches making a trip here interesting for divers and snorkelers as well as other tourists. Enjoy this number one dive destination in the world.